This past weekend I went to upstate New York to see my friend at Lake Luzerne. It was such a nice escape from city life. The lake's water was amazingly clear and fresh, the sky was perfect with just the right amount of sun peeking through fluffy, Texas-like clouds (yes, Texas clouds are special, I said it). It would have been nice to spend more time up there. Right as we got back into the city it was stress-central. Cars everywhere, people everywhere, the exact opposite of life at the lake. I still love the city though. We are a stone's throw away from Brooklyn Bridge Park and walking to Manhattan from where we live has got to be the best 2 hours ever spent, especially if you reward yourself with soup dumplings from Chinatown. Also the food culture just can't be beat. I'm still on the hunt for my favorite restaurants. I know it's going to take a while, since it took us years in Chicago, and we were still finding amazing places right before we left. Speaking of food, stone fruits have been everywhere for over a month now. Unfortunately I haven't been taking advantage of the short season as much as I was hoping to. In the next few weeks, maybe I'll come up with some delicious ways to use them. 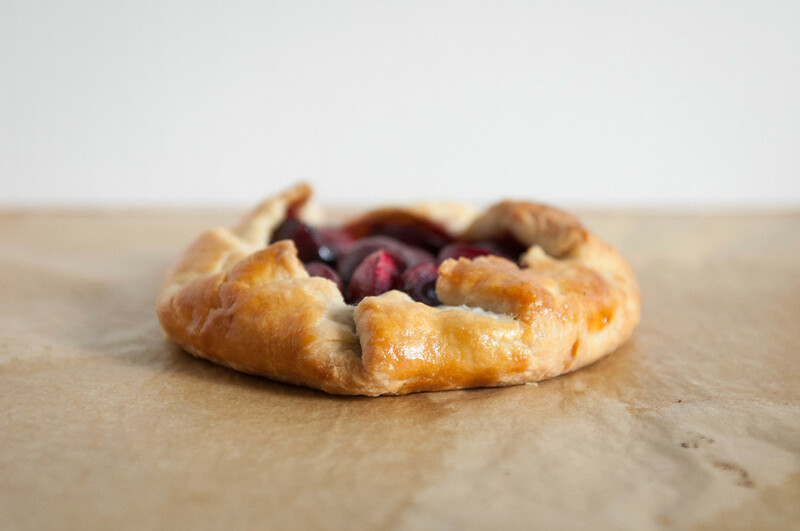 For now here's a cherry galette cause who doesn't love something wrapped in pie crust? I know this probably marks the 1,684th galette you've seen this summer but these are cute and mini-sized! This recipe uses sweet cherries; if you have sour cherries, up the sugar and omit the lemon juice. When making the dough, make sure everything is cold cold cold. If you have an especially warm kitchen, freeze the flour before using, and after cutting in butter, place your bowl in the freezer for 5 minutes before adding liquid ingredients. Never let the butter melt. In a mixing bowl, combine flour and salt. Using a pastry blender, cut butter into flour until small pieces of butter remain and the mixture is crumbly. Whisk together sour cream, ice water, and lemon juice. Add to flour/butter mixture and combine with a spoon. Once dough starts coming together, use your hands to knead it a few times over and form it into a ball. Do not overwork the dough, you still want to see distinct pieces of butter. Cover with plastic wrap and place in fridge for at least an hour. Split dough into four even pieces. 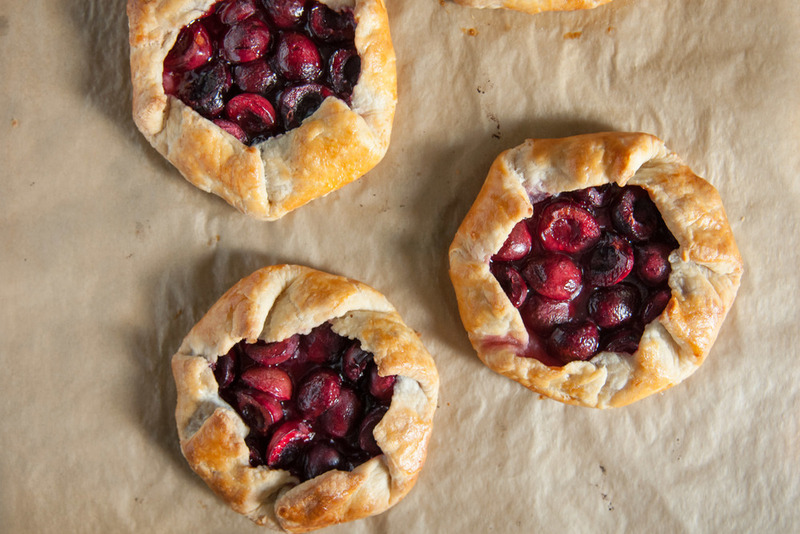 Place the other three pieces back in the fridge while you form your first galette. Roll dough out until it is 7 to 8 inches in diameter. Mix all of the filling ingredients together. Transfer dough to a parchment paper lined baking sheet. Place a 1/2 cup of filling in the center. Fold edges over so that each consecutive fold overlaps the previous one. Repeat rolling, filling, and folding for the remaining three pieces of dough. Whisk together egg and water. Using a pastry brush or your fingers, brush tops of dough. Bake for 30 to 35 minutes until pastry is golden brown. Let cool for 5 to 10 minutes before eating.